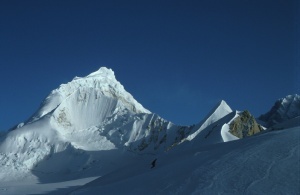 My favored country to travel is Nepal. There you can get in touch with the real nature and get really away from the civilization. Anyway, in the main cities (Katmandu and Pokhara) for sure it is even possible to check your E-Mail and get access to the internet.There probably you will find the best trekking in the world. 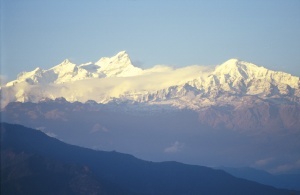 There are some well known trekking areas like the Everest Trek or the Anapurna Trek. But once you get away from the main tourist trekking routes, you can experience Nepal as it is: a very poor country were the people live mainly eating 'Dal bat' (rice, vegetables and lentils) twice a day, working on their fields but seems to live happy with what they have. For sure you will never forget the snow covered mountains. 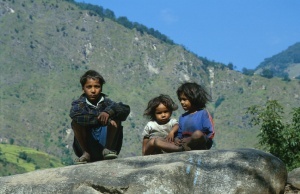 Typically for Nepal are the porters. You probably want find anyware in the world people working so hard for their money. The most I have seen was a porter carrying 110 kg. 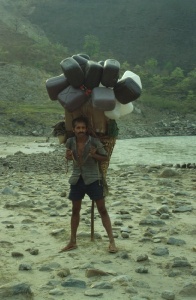 Can you imagine to walk 10 hours per day carrying 110 kg on your back?? For sure the average is not so much, but 60-80 kg is enough, isn't it? ?